Love reading this, I wish thrifting was my full time job <3 Can't wait to read the other interviews! This is such a great interview with Sammy! I hope a lot of people turn to thrifting because of this article! I know I am one of them! Do it! We love indoctrinating people to the thrify side! But be warned, it's addictive! I love her! Great feature! I love Sammy D! 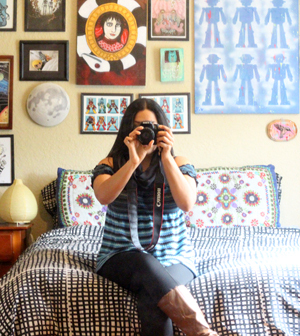 She is so darn cute & love her passion for thrifting:) Great post! Reyna: She's fun, I love her energy. It shines through in her photos. It's great to see someone living the dream. Charleen: Yes indeed! :D she inspires me to keep working hard on mine.